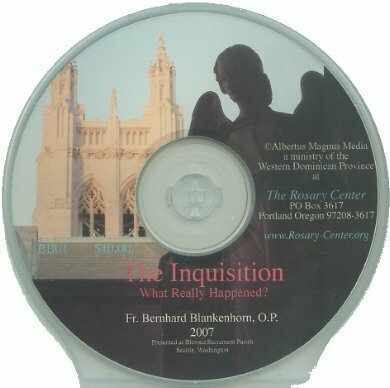 The Inquisition - What Really Happened? A source of scandal or shame to many, the "Inquistion" continues to fascinate the historical imagination. Yet often that history is filled with erroneous claims, myths or simple polemics. Fr. Bernard Blankenhorn, OP presents an overview of the Medieval and Spanish Inquistions within their legal, cultural and religious contexts. He considers the motivations of certain institutions and peoples for participating or supporting the Inquisitions as well as the actual effects that they had on individual lives and society at large. Six mp3 files: The talk, followed by Q&A.